Just as controlled-release medications slowly dole out their cargo after they experience a pH change in the body, implanted “artificial muscles” could someday flex and relax in response to light illuminating the skin. In pilot studies, scientists have developed a new material that expands and contracts, lifting a weight merely by shining a light on it. “We have developed a new polymer that has a novel mechanism for actuating materials — making materials shrink, expand or hold a ‘memory’ of a particular shape — all with a simple stimulus,” says Jonathan Barnes, Ph.D.
Stimuli-responsive materials have been applied in many different industries to date. For example, some of them change color and are used as windshield coatings to instantly shade drivers in blinding sun. Other materials can be formed into vessels that respond to changes in nutrient concentrations and feed agricultural crops as needed. Still other applications are in the biomedical area. Barnes and his team at Washington University in St. Louis (WUSTL) are running their new polymer through its paces to determine what it is particularly suited for. But the main goal has been to see whether the material can do work, a trait that could facilitate development of an artificial muscle. During graduate school, Barnes studied a group of molecules, known as viologens, that change color with the addition and subtraction of electrons. Barnes suspected that if these molecules were linked together, they would fold like an accordion because areas that accept a single electron recognize one another. He also wondered if the action of the folding molecules could make a 3D network move, and if he could make the process reversible. 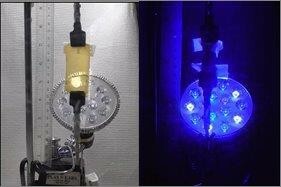 A polymer (left; beige material) contracts in blue light (right). To address these issues, Barnes’ team at WUSTL synthesized polymer chains with viologens in their backbones. When a blue LED light was shone on the molecules, they folded into pleats with the help of well-known photoredox catalysts that can transfer electrons to the viologens. The researchers next incorporated the polymers into a flexible, water-soluble 3D hydrogel. When the team shone light on the gel, the accordion effect that occurred within the molecule tugged the gel in on itself, causing the material to shrivel to one-tenth its original size. When the light was turned off, the material expanded. As the polymer-embedded hydrogel changed form, it also changed color. “The beauty of our system is that we can take a little bit of our polymer, called a polyviologen, and put it in any type of 3D network, turning it into a stimuli-responsive material,” Barnes says. Less than one percent of the weight of the hydrogel needs to contain polyviologen to get a response. So the polymer doesn’t impose a significant effect on the other properties of the material in which it is contained. To find out if the material could do work, the group attached the gel to a strip of electrical tape with a piece of wire at the end. They suspended a small weight from the wire and hung the hydrogel in front of a blue light. The gel lifted the weight — which was about 30 times the mass of the embedded polyviologen — and after five hours, it rose several centimeters. The group has now made other tweaks, including making the gels stronger and more elastic, and making them move faster. And the researchers have developed polymers that respond to multiple stimuli at once. They also have constructed gels that respond to light at different wavelengths. Materials that respond to red or near-infrared light, which can penetrate human tissue, could be used in biomedical applications, such as drug-delivery devices or, eventually, as artificial muscles. Barnes says that his group has only begun to test the limits of these new materials. Currently, the team is studying the self-healing properties of polyviologen-embedded hydrogels, and they are exploring the possibility of 3D printing the polymers into different types of materials. The researchers acknowledge support and funding from the David and Lucille Packard Foundation Fellowship in Science and Engineering and Washington University in St. Louis.